The Dukes Retreat offers one of the largest and modern banquet halls in Lonavala. 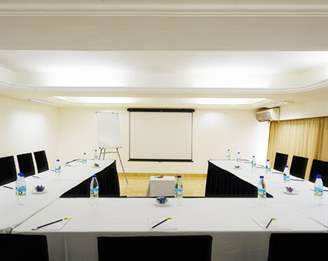 The resort has eight well-equipped conference rooms ideal for meetings and gatherings. The lotus conference hall, measuring 5865 square feet, is situated on the ground level and connected to the lawns for Wedding Parties and Gala Dinners. This is an ideal venue for meetings and conventions with 400 Pax in theatre style, 150 Pax in classroom style and 170 Pax in cluster seating arrangement. Windsor, 1269 square feet, is situated on the 2nd level. This hall can be arranged in the auditorium style (approximately 40 persons), double U style (45 persons with writing table) and classroom style (approximately 30 persons). Edinburgh, measuring 1269 square feet, is centrally air-conditioned and is structured to enable different seating arrangements. Located on the 1st level, the hall can be arranged in the auditorium style (approximately 40 persons), double U style (45 persons with writing table) and classroom style (approximately 30 persons). Wellington hall, measuring 741 square feet, is ideal for an open U style seating arrangement for 32 persons with a writing table. The air-conditioned hall comes with a flip chart board, TV trolley, white boards, pin boards and a small storage unit. Somerset, measuring 551 square feet, is a fully equipped boardroom for 15 persons. This room is situated below the lobby space and can be arranged in class room style (approximately 25 persons) and U style (approximately 15 persons). Richmond, measuring 361 square feet, is ideal for more intimate gatherings and breakaway meetings. This is structured for a typical round table conference with two tables, air-conditioning, screen, flip chart board, projector; the room can comfortably accommodate 15 persons. Lotus lawn, measuring 30000 square feet, is ideal for your big impressive celebration and can adequately accommodate from 1200 to 1500 persons. This is an amazingly gorgeous lawn to add that natural scenic beauty and comfort to your celebration.